The freedom of peaceful assembly protects the right of groups to meet together in order to exchange ideas and information, to hold a peaceful protest, to strike and to publicly express their views. This freedom is thus closely related to the freedom of expression. In this case however, ideas are collectively expressed. Participating in non-violent demonstrations supporting or opposing public policies and practices constitutes an important form of direct citizen action. Peaceful assembly has been referred to as "speech in action." It is the physical act of meeting so as to communicate and share thoughts, emotions, and friendship. A group of high school students, after organizing a successful 'No Sweat' campaign in their school, decided to take their concerns to the wider community by organizing a protest at their local shopping centre. 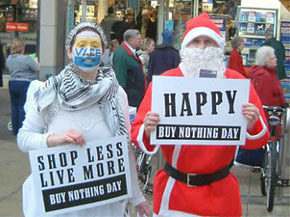 They chose November 28th, 'Buy Nothing Day', as the date for their demonstration. Initially, the protest was a success. Most students marched quietly near one of the entrances of the mall. Others distributed leaflets. Shoppers were interested in their message. The newspaper sent a reporter to cover the event. Yet, the protesters were soon asked to leave by mall authorities. The authorities told them that the mall is reserved for shoppers and merchants and that their message was inappropriate. Do the students have the right to protest in the Mall? Does the Mall Manager have the right to tell them to leave?